stunning and extraordinary. View some of the finished pieces on The Art Of Vikki's Instagram account. This coloring book has 52 unique hand drawn images, one per week, for an entire year of good vibes. A delightful mix of Bible quotes and general inspiration in a variety of open work text will lift your spirits and sooth your soul. 24 bonus sheets with decorative borders, two per month, provides room for Bible journaling or jotting down thoughts. 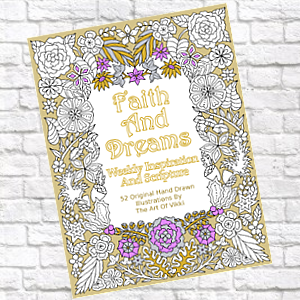 Appropriate for grownups and young adults, Faith And Dreams is a one of a kind colouring book filled with pretty garden inspired artwork and a Christian theme which makes it a thoughtful gift at any time of the year. Faith And Dreams is my fifth coloring book for grownups. I do hope you have as much fun coloring it as I did drawing it. 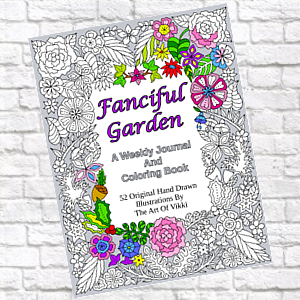 Fanciful Garden is a weekly journal you can color. 52 hand drawn designs have extra space for diary style entries, bullet journaling or really cool backgrounds. There are 24 bonus pages, two per month, which provide additional space for your hopes and dreams amid the fanciful borders. Perfect for young adults and grownups, this colouring book is a mix of original garden inspired drawings - trees, birdhouses, butterflies, fancy fences and mushrooms with a few critters here and there are just a taste of the hand drawn artwork inside. This is my fourth adult oriented coloring book. I absolutely loved drawing this one. Have fun! Coloring is fun, coloring is art and yes, coloring is for grownups! 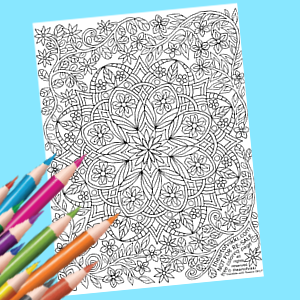 Relax and unwind with this original adult coloring book with a mixed theme of mandalas, flowers and whimsical patterns. 50 hand drawn illustrations fill this coloring book for adults that can be colored in your lightest pastels or your most vibrant neon colors. Makes a unique gift for the serious colorists and the smaller 8 1/2" x 8 1/2" size makes it a relaxing addition to your travel gear. The designs are fairly intricate but larger spaces leave room for fun with glitter pens and a variety of coloring techniques. 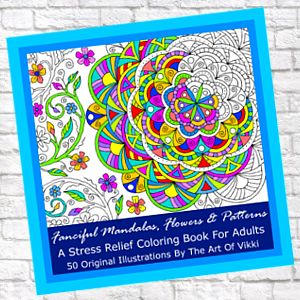 Fanciful Mandalas, Flowers And Patterns is my third coloring book for adults. Color it beautiful. Shake off that stress with this original adult coloring book. The wedding theme celebrates bridal fashion, wedding traditions, and love. 40 hand drawn illustrations fill this coloring book for adults that can be colored any way you wish. Create your own artwork then frame your masterpieces to decorate your home or remember your special day. Makes a unique gift for brides and bridesmaids too. This is my second coloring book to be published. I hope you enjoy coloring it as much as I enjoyed illustrating it. Coloring For Grownups! 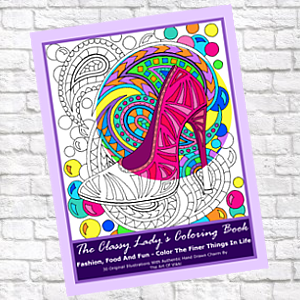 Relax and unwind with this fun adult coloring book with a girly theme that celebrates fashion, accessories, fancy foods and beverages. 30 original illustrations fill this coloring book for adults that can be colored any way you wish. Create your own artwork then frame your masterpieces to decorate your bedroom, kitchen or bath. If you have a Housewives sized closet, you could even hang one in there too! This was my first coloring book to be published and I hope you enjoy it as much as I enjoyed creating it. 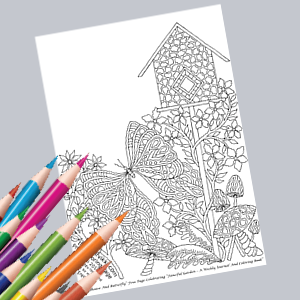 "Birdhouse And Butterfly II" is a hand drawn coloring page celebrating the publication of Faith And Dreams - Weekly Inspiration And Scripture . This design was created exclusively as a free download and is not included in the coloring book. 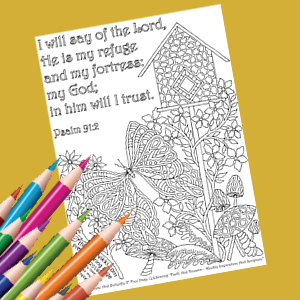 Download, print and color this one of a kind Christian coloring page. Please enjoy. "Birdhouse And Butterfly" is an original coloring page celebrating the publication of Fanciful Garden - A Weekly Journal And Coloring Book. This artwork was created exclusively as a free download and is not included in the coloring book. Please download, print and color this free page as my gift to you. Have fun with it. "Mandala With Flowers 0817" is a unique coloring page that coordinates with Fanciful Mandalas, Flowers And Patterns - A Stress Relief Coloring Book For Adults. This design was created exclusively as a free download and is not included in the coloring book. 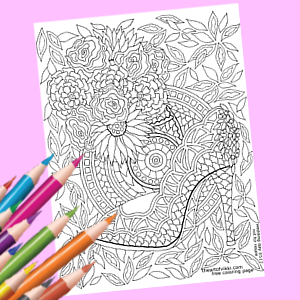 This free colouring page is available for you to download, print and color. Enjoy. 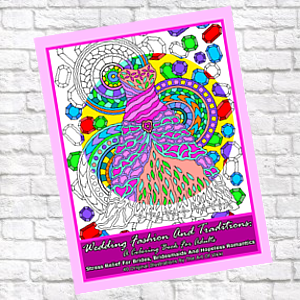 "Wedding Day 0517" features a wedding bouquet and fancy wedding shoe that coordinates with Wedding Fashion And Traditions - A Coloring Book For Adults. This design was created exclusively as a free download and companion piece and is not included in the coloring book. 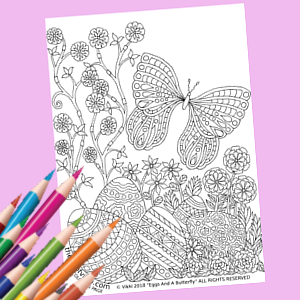 This free coloring page is available for you to download, print and color. I hope you like coloring it. "Makeup 0217" features lipstick, nail polish and eyeshadow to coordinate with The Classy Lady's Coloring Book. This design was created exclusively as a free download and is not included in the coloring book. This free coloring page filled with girly makeup is available for you to download, print and color. Have fun. "Halloween Twist 1017" is my take on an adult coloring page for my favorite holiday of all - Halloween! 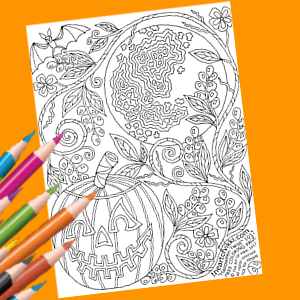 This free colouring page is available for you to download, print and color any way you wish. Celebrate Halloween with a grinning Jack-O-Lantern, full moon, a wee little bat and twisty vines. Have fun and make it spooky. "Christmas Tree 1017" is an intricate adult coloring page for that most wonderful time of the year - Christmas! 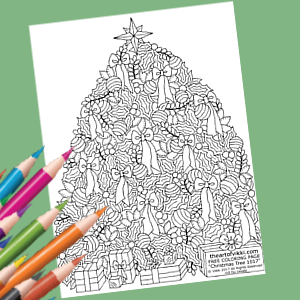 Available as a free download, this hand drawn holiday tree is ready for you to print and color any way you wish. Snuggle up on the couch, grab a cup of cocoa and color the holly leaves, fanciful berries, ornaments and bows. I really had fun creating this illustration - I hope you enjoy colouring this Christmas tree for a colorful and very happy holiday. "Eggs And A Butterfly 0218" is a pretty Easter coloring page for adults and maybe the kids too. Available as a free download, this hand drawn image is ready for you to print and color. Filled with intricate Easter Eggs, a variety of flowers and a fanciful butterfly floating in the breeze, this original illustration is my Easter gift to the coloring community. Make it beautiful and have fun! All items/photos on this webpage are subject to copyright and may not be reproduced without prior written permission from the artist.